More News About Powerpuff Girls sets! It’s not much, but there’s a new photo from the LEGO Group showing more characters from the upcoming Powerpuff Girls sets. As you’ll recall from yesterday, LEGO announced that we would be getting at least 2 sets based on the Powerpuff Girls TV series. 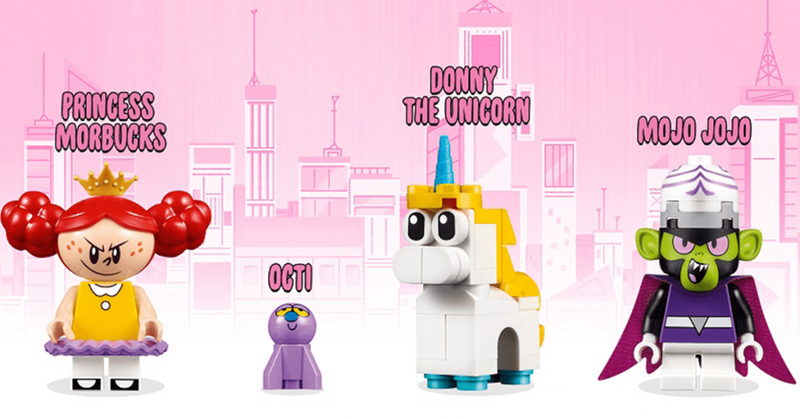 Princess Morbucks and Mojo Jojo appear to be fairly standard minifig type characters while Octi and Donny the Unicorn are brick-built. The styles of course match the new series well and fit the characters, but none of the figures look like “regular” LEGO figures. The size of the heads and some of the hairpieces are just… new. I can’t wait to see what creative ways people come up with to use them. TheBrickFan is reporting they’ll be split across the 2 sets making it necessary to buy both in order to get all 3 of the Girls. The sets look relatively small in the spoiler pics, so hopefully the cost is reasonable.